Based on state-of-the-art 16nm FinFET Plus process technology to pack over 7 billion transistors and 1792 CUDA cores and up to 5.3 TFLOPs of single precision compute power. 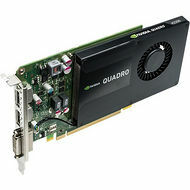 The Quadro P4000 graphics board is the industry’s most dominant single-slot form factor graphics board, which is for computationally demanding design visualization or immersive design reviews. Get real interactive experience with today’s demanding professional workflows. 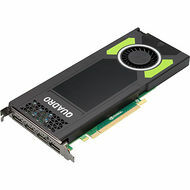 NVIDIA SLI Bridge Kit (HBSLIBRIDGE-2W2S-KIT / HBSLIBRIDGE-2W3S-KIT) leverages multiple GPUs to dynamically scale graphics performance, enhance image quality, expand display real estate. Order PNY Part Number HBSLIBRIDGE-2W2S-KIT or HBSLIBRIDGE-2W3S-KIT depending on motherboard PCIe slot spacing. DisplayPort to HDMI Four Pack (DP-HDMI-FOUR-PCK) Connect the Quadro P4000 to HDMI displays at resolutions up to 4K with PNY Part Number DP-HDMI-THREE-PCK. 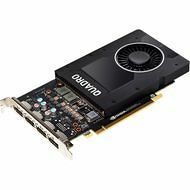 The four included DisplayPort to HDMI adapters are recommended by NVIDIA, provide outstanding image quality, and are built to professional standards. DisplayPort to HDMI Single Pack (DP-HDMI-SINGLE-PCK) Connect the Quadro P4000 to an HDMI display at resolutions up to 4K with PNY Part Number DP-HDMI-SINGLE-PCK. The included DisplayPort to HDMI adapter is recommended by NVIDIA, provides outstanding image quality, and is built to professional standards. DisplayPort To DVI Four Adapter (DP-DVI-QUADKIT-PB) Connect the Quadro P4000 to DVI-D SL displays at resolutions up to 1920 x 1200 with PNY Part Number DP-DVI-QUADKIT-PB. The four included DisplayPort to DVI-D SL adapters are recommended by NVIDIA, provide outstanding image quality, and are built to professional standards. DisplayPort To VGA Cable Adapter (DP-VGA-QUADKIT-PB) Connect the Quadro P4000 to DVI-D SL displays at resolutions up to 2048 x 1536 with PNY Part Number DP-VGA-QUADKIT-PB. The four included DisplayPort to VGA adapters are recommended by NVIDIA, provide outstanding image quality, and are built to professional standards. NVIDIA Quadro SYNC II (VCQPSYNC2-KIT) enable the creation of dazzling ultra-high resolution, perfectly synchronized displays to meet the visualization and presentation needs across industries. 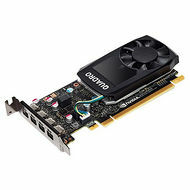 Designed for flexibility and scalability, Quadro Sync boards connect to select NVIDIA Quadro GPUs, synchronizing them with the displays or projectors attached to them. Quadro Sync also enables NVIDIA Quadro Mosaic™ technology on those synchronized displays and projectors, providing an easy way to scale the resolution of any application. 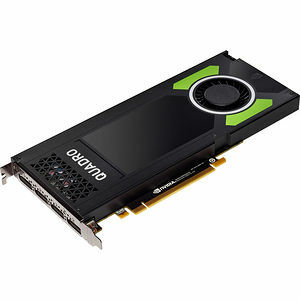 NVIDIA Quadro Graphics. Breakthrough in Every Form. 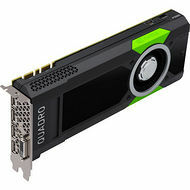 NVIDIA Quadro Visualization. Advanced Multi-Display and Accelerated Rendering.